Pad Safe is a unique blend of water emulsible silicone, synthetic lubricants and corrosion inhibitors designed to readily mix in the water storage tank and remain in suspension. Use Pad Safe on older/larger more established trees, the extra silicone will assist with the more vigorous shake needed to release the nuts from their branches. Pad Safe was designed, developed and tested in conjunction with three of the top manufactures of tree shakers for use in commercial tree shakers equipped with water injection lubricators. In testing on large and hard to shake trees Pad Safe exhibited a 50% reduction in sling usage and 60% to 80% reduction in barked trees. Pad Safe contains a proprietary combination of polydimethysiloxane, polymeric lubricants and low micron solids that reduce frictional wear. The low micron sizes of the solid friction modifiers in Pad Safe greatly increase the surface area of the solids. This reduces the frictional drag of the sliding surfaces of the pads and slings allowing better lubrication with less volume. The sub micron solids in Pad Safe penetrate into pads and slings and create multiple layers of protection. This reduces wear and increases sling life. Pad safe is highly concentrated and economical to use. When combined with water, Pad Safe will form a heat resistant lubrication barrier that conditions and preserves, maintaining the natural elasticity and pliability in rubber components. Pad Safeis not affected by heat and will remain on the contact area even in the most severe conditions preventing blistering and cracking. 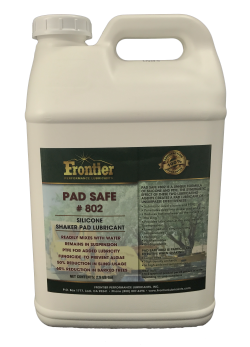 When used in dusty and highly contaminated applications such as nut harvester’s encounter, Pad Safe will remain contaminant free. Pad Safe will not leave a sticky residue to attract dirt and contaminants. Equipment will remain contaminant free for ease of service. Add 1 to 2 quarts of Pad Safe per 25 gallons of water, depending on crop conditions. Recommended injection per side 3/4 oz. Recommended injection per side 1/2 oz. The above recommendations are an average. The amount of product used in a 25-gallon tank can be increased or decreased depending on crop conditions and age and size of tree.These recommendations are a point of reference and should be used for that purpose. The elevated per side injection recommendation on walnuts also applies to any tree that requires scaffold shaking. The inconsistent angle of the shaker head requires more volume of fluid to aid in flow to the contact patch.